Cyber Monday is over... but who says great sales only last one day? We’re giving you a whole week to take advantage of our biggest discount ever. From now until Dec. 4, take up to 20% off* of our two newest books and a beloved holiday classic. During this sale, our latest personalized children's novel, Song Quest, is only $19.95, and personalized classics Robin Hood and A Christmas Carol are just $23.95 each. * Paperback editions are 20% off; hardcover editions are 12% off; shipping and photo options are extra. Hot off the press: Song Quest and Robin Hood, adventures for all! Our newest books are perfect for children and adventure-loving readers of all ages; perfect for the holidays and this season of magic. In Song Quest, music takes our main characters on a thrilling journey. When an alarming illness attacks the island of Bedlington, two talented children vow to save their families by seeking a cure found across the sea. They rashly sneak off and begin their adventures, meeting a variety of creatures from the fantastic to the frightening: talking butterflies who shrink the children down to the size of insects; a chorus of tiny turtles; a race of noble elves with a captive princess; and a terrible enemy known as the Wolfagones. Throughout, the power of friendship, the magic of music, and their own skills and courage guide our two friends toward their goal. Song Quest will enthrall and encourage artistic creativity in children of all ages. Buy Song Quest now for just $19.95 (regularly $24.95). Meanwhile, our latest Classic Book By You release is Robin Hood, the legendary tale of the famous outlaw who steals from the rich to give to the poor. Fight for justice and explore Sherwood Forest in the customizable roles of Robin Hood, Maid Marian, Little John, and more of Robin's Merry Men. Best of all, this edition is perfect for kids and adults alike. During our sale you can "steal from the rich" by grabbing your own personalized Robin Hood for just $23.95 (regularly $29.95). Also from our classic division, what better way to share the holiday spirit with a personalized edition of A Christmas Carol? 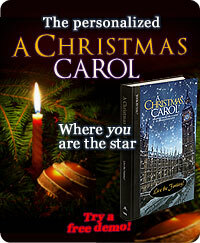 Pinch your pennies like Scrooge and buy your own copy of A Christmas Carol for just $23.95 (regularly $29.95). And of course, whether you're thrilled by fantasy, historical adventure, modern humor, sci-fi, exotic getaways, or literary classics, we have personalized novels for everyone. Make this the most personal holiday season ever. Shop now and live the fantasy with Book By You.